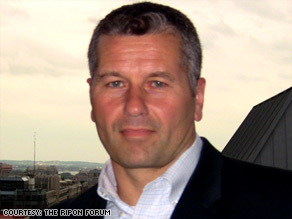 Editor's note: Lou Zickar is the editor of the Ripon Forum, a centrist Republican journal of political thought published by the Ripon Society. He is a former aide to Rep. Mac Thornberry, a Republican from Texas. Lou Zickar says Republicans should pay attention to what Democrats did when they were beaten. (CNN) -- In his CNN.com column last week, Ed Rollins said of the Republican Party, "We may be down for awhile, but what we won't become is a 'Democratic Party lite'! We are a party that wants smaller government and lower taxes. Obama and the Democrats do not. We are a party that wants to encourage small business." I used to work for Ed Rollins. He probably doesn't remember me; it was the election cycle of 1990, and I was one of his many employees at the National Republican Congressional Committee. My formal title was Deputy Director of Strategy and Research. But the actual thrust of my job was doing opposition research for GOP campaigns across the country. In other words, I dug up dirt on Democrats. One of my most vivid memories of Rollins during that time was of his bucking the White House in the summer of that year. It was just after the budget summit that the Democratic congressional leadership held at Andrews Air Force Base with the Bush administration. Then-OMB Director Richard Darman cut a deal with Rep. Dan Rostenkowski to raise taxes, and President George H. W. Bush, who had pledged not to raise taxes ("Read my lips..."), agreed to it. Then all hell broke loose. Conservative Republicans on the Hill led by Newt Gingrich staged a revolt against the plan, while at the NRCC, Rollins wrote a memo advising all Republican candidates for the House to oppose it. White House Chief of Staff John Sununu hit the roof, and Rollins became persona non grata at the White House. The budget plan passed anyway, and taxes were raised. Within two years, however, the Republican base deserted the president and Bush was voted out of office. Still, the stage had been set. The principles set forth by Gingrich and Rollins in the summer of 1990 laid the foundation for the Republican Revolution of 1994 and the GOP's winning of both the House and the Senate that year. So when Ed Rollins says Republicans need to stick to their basic principles and not compromise their beliefs, he speaks from experience, and he is right. Where he misses the mark is in his assessment of how the Democrats twice worked their way back to power -- the first time was after the pastel convention of 1984 in San Francisco, California, which marked a low point in the party's pursuit of the White House and set in motion an effort that culminated in 1992. And the second, after the debacle of 1994, was when the party had to contend with the reality that the American electorate had shifted right and the big government/higher tax solutions Democrats had been offering up since the New Deal no longer held the same popular appeal. Rollins contends that Democrats clung to their big government beliefs during their years in the wilderness. While it is true that the liberal leaders of the party on Capitol Hill -- the old bulls like Charlie Rangel and Ted Kennedy -- stayed true to the far left positions on which they had built their careers, it is also true that there were other forces both inside and outside the Democratic party that acknowledged the need to turn to the center. And this is the most salient point in the debate Republicans are having about the future of their party today. Indeed, after Walter Mondale's landslide defeat in the election of 1984, a group of Democratic governors and operatives established a new policy organization called the Democratic Leadership Council that was intended to free the party from its longtime liberal moorings. The DLC developed centrist policy ideas on issues ranging from welfare reform to balancing the budget. It also promoted centrist candidates, including Bill Clinton, who won the White House in 1992 on a platform that was basically written by the DLC. Similarly, after Republicans recaptured both Congress and the White House in 2004, Rahm Emanuel, then chairman of the Democratic Congressional Campaign Committee, embarked on an effort to recruit candidates who could also compete for the middle and win in districts where liberal Democrats would traditionally lose. His efforts resulted in the election of congressmen like Heath Shuler in North Carolina, Brad Ellsworth in Indiana, and Bruce Braley in Iowa. Each is a centrist who won in a district previously held by a Republican. Each is also the kind of Democrat who helped the party recapture the House. The success of these efforts provides the GOP with a road map on how to rebuild their party today. In this, Rollins is right -- Republicans should not abandon their core philosophy of a strong defense, low taxes and smaller federal government. But they do need to figure out how to make this philosophy relevant to the lives of more Americans. And for this, they would be wise to do what the Democrats did in 1992 and 2006. They need to turn toward the center. Among other things, this means coming to grips with the role of government in our lives. For nearly 30 years, the party's position in this regard has been clear and absolute -- government should be smaller. But Katrina and Iraq and Walter Reed brought to light a simple truth -- government needs to be more efficient, too. Unfortunately, smart government is not in the Republican Party's rhetorical toolbox. It also runs counter to everything many on the far right represent. Yet it's going to be one of the defining issues of the next few years as taxpayers begin to demand greater accountability and transparency in how their federal tax dollars are being spent. Simply arguing that we need to establish pro-growth tax policies and leave it at that is not enough anymore. Republicans also need to acknowledge government has a role to play, and it is the responsibility of all elected lawmakers to get it right. Taking this kind of step would not only move the GOP closer to the political center, but would also be another step in the party's journey back from political oblivion.